The glittering Principality of Monaco hosts the third GP2 encounter of the year, where the P Zero Yellow soft and P Zero Red supersoft have been made available: just as is the case in Formula One. These are well suited to the tight and twisty track, because of the optimal warm-up time, mechanical grip and performance offered by the softest compounds in the range. This is the first time that the supersoft has been used in GP2 competition this year: the fastest compound in the range but one that also needs careful management. Qualifying is split into two 15-minute groups on Thursday afternoon, following one 45-minute practice session in the morning. This means that the drivers will need to try and unlock the performance from the tyres as quickly as possible, as they will not get the chance to build up their speed. Unlike the venues visited so far this season, the drivers and teams will have no experience of testing at Monaco, making it all the more important for them to grasp the specifics of set-up and tyre behaviour immediately. Pirelli’s racing manager says: Mario Isola: “Monaco is one of the most challenging races of the year, for a number of reasons. One of the key aspects is the lack of run-off: it’s very easy to make a mistake, and these mistakes are normally punished immediately. Managing the tyres is an equally important area. The speed delivered by our latest 2015 supersofts is exceptional, but of course drivers need to ensure that they get the most out of this high-performance compound during the race as well. With overtaking quite difficult in Monaco, tyre strategy is an area that can make a crucial difference in Monaco, as we saw last year when Felipe Nasr went from 18th on the grid to third at the finish. In fact, the strategy options are more open in GP2 than they are in Formula One, as drivers are not obliged to start the race using the tyres they qualified on. This should allow all the drivers to maximise their opportunities through clever tyre usage no matter where they start on the grid, with big potential rewards for a brave strategy. The result is normally some spectacular and entertaining racing.” The challenge for the tyres: Track evolution is generally high around the streets of Monte Carlo, which are also the most slippery of the year due to their use as normal roads for most of the time (the track is also open to public traffic at certain points during the weekend). The GP2 drivers will experience an incredibly ‘green’ surface when they first take to the track, which will eventually rubber in over the course of the weekend as more competition cars drive on them. With the GP2 practice sessions, qualifying, and races taking place at quite different times of day, the drivers are likely to experience varying track conditions and grip levels each time, making it hard to get an accurate measure of wear and degradation rates. Traffic is often a major issue for the 26-car GP2 field in Monaco, especially at the first corner. In the past there have been incidents that have affected a large proportion of the field, prompting a safety car. This possibility has to be factored into strategy calculations, which means that the drivers and teams best able to think on their feet often gain the most. Teams run maximum downforce in Monaco, but as the circuit has the lowest average speed of the year, the cars are still much more dependent on mechanical grip from the tyres rather than aerodynamic grip to negotiate the corners. Nonetheless, wear and degradation is generally low, especially on the soft compound. Initial weather forecasts suggest that there is the possibility of intermittent rain showers during the Monaco weekend. If this is the case, it will make what is already an unpredictable race too close to call. So far in 2015, there has not been a wet GP2 race. The race and the rules: Every car will have five sets of dry tyres and three sets of wet weather tyres available for the GP2 race weekend. The five sets of dry tyres comprise three sets of the harder compound (soft) and two sets of the softer compound (supersoft). The drivers can use their tyre allocation in any way they like, but at least one set of each compound must be used in the feature race (unless it is a wet race). One set of the harder compound must be returned after free practice. There is a very different format to the weekend in Monaco, with cars already on track during Thursday and GP2 being the only race on Friday before the circuit is opened to the public. Qualifying takes place in two groups at 16:15-16:31 and 16:39-16:55 on Thursday, after practice at 12:00. Race One on Friday is run at 11:15 over 42 laps (or one hour) and each driver must complete one compulsory pit stop. This cannot take place within the first six laps. 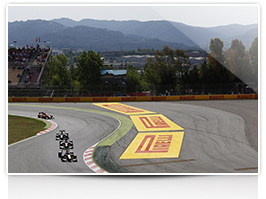 Unlike Formula One, GP2 drivers do not have to start the race using their qualifying tyres. The grid for Race Two on Saturday at 16:10 is determined by the finishing order of the first race, with the top eight positions reversed. Race Two is run over 30 laps (or 45 minutes), with no compulsory pit stops.